Discussion in 'Crochet, Knitting, Spinning' started by Weedygarden, Feb 12, 2018. I saw this pattern and immediately was drawn to it, because of the possibilities of using something like this when going on a walk, or somewhere that carrying a purse or backpack is awkward. After I looked at this yesterday, I thought about making something similar out of leather. If I was to crochet this, I would not use this yarn. 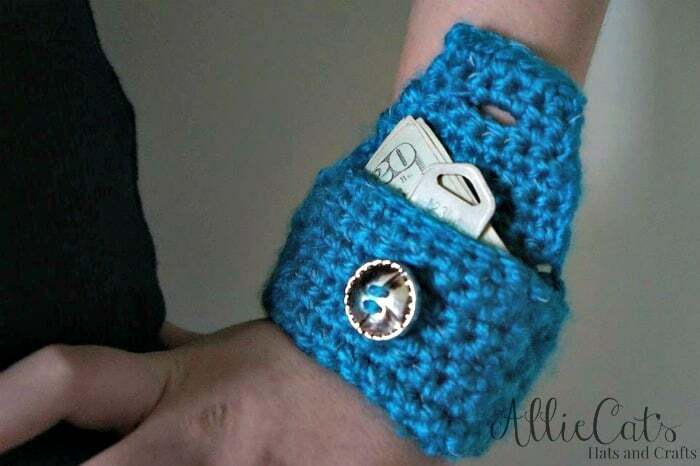 This little wrist pouch works up in no time, using Red Heart Reflective yarn, and it perfect for holding small things, such as cash or a house key during your morning or evening jog. Ch. 1 at the beginning of each row WILL NOT count as a st unless noted otherwise. Click HERE to continue on to this pattern on the AllieCat’s Hats and Crafts blog. Terri9630, Maxine in Oregon, TMT Tactical and 4 others like this. That's cool. That little flap thing folds down and it buttons. What kind of yarn would you use, Weedy? COSunflower, TMT Tactical, MoBookworm1957 and 1 other person like this. I think you could use many kinds of yarn. My knitting friends in my crafting group like high end yarn, but some people use Red Heart, often viewed as low end yarn. I am more likely to use Red heart myself because the price of other yarn can be so high. 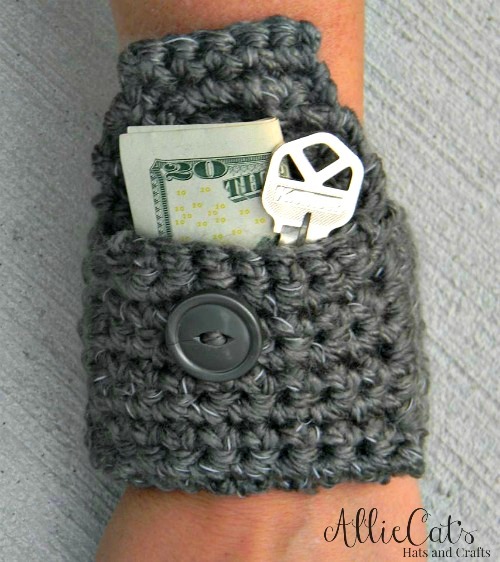 I also think that you could use leftover yarn from other projects to make this. I don't think it would take half a skein, and maybe less than 1/4 skein. This wristlet would be great for runner and joggers, children, and others who need to carry a key and not lose it, even preppers. TMT Tactical, COSunflower, MoBookworm1957 and 1 other person like this. That's cool. I can see wearing one of those hidden on my ankle when traveling. Terri9630, Weedygarden, Patchouli and 4 others like this. Thank you WeedyGarden!!! I love it!!! Thanks for the pattern. I'm going to make one!!! Weedygarden, TMT Tactical, MoBookworm1957 and 1 other person like this. Last Friday or newest grandbaby as born 5 weeks early. I had read a thread with @MoBookworm1957 and I believe @Sunshine that were talking about the little octopuses for preemies so I decided to look up a pattern to make. Thank you ladies! COSunflower, Weedygarden, Terri9630 and 1 other person like this. Crocheting a shawl made out of doily thread for Christmas present for daughter in law. Crocheted collar for mom for Christmas. Youngest son is getting regifted hugemongus turkey platter. Oldest son is getting gas card, movie theater tickets card. Estelle is getting lots of love, kisses, and hugs from Granny. She's also getting Twin size Pineapple Quilt. Weedygarden, Patchouli, Maxine in Oregon and 1 other person like this. Dani, COSunflower, Patchouli and 1 other person like this. I completely forgot about this thread! Thanks MoBookworm1957! I have missed many patterns that I could have added over the past year. Dani and MoBookworm1957 like this. Patchouli, Dani and Weedygarden like this. Mo, I just ADORE the shawl!!! Uncles crocheted quilt is really going to be nice too!!! Dani, MoBookworm1957 and Weedygarden like this. Patchouli, COSunflower, Weedygarden and 2 others like this. Nice idea and so much detail. Love the banana! COSunflower, Weedygarden and MoBookworm1957 like this. Has anyone heard of or do knooking? Yes, but haven't tried it yet. I just bought the starter needles. I am going to learn, hopefully. Patchouli, MoBookworm1957 and Weedygarden like this. Let me know how it goes please. Patchouli and NannyPatty like this. Well don’t get the beginner kit from Leisure Arts. I can’t even see the needle sizes and had to label them. I was pretty frustrated because of that. Dani, COSunflower, MoBookworm1957 and 2 others like this. Sitting here crocheting raspberries, plums for play kitchen order to go out in April. Need to do up lemons, limes, bananas, oranges, grapes, cherries. Then will start on vegetable orders too. That order is cabbage that they can peel outer leaves off of, broccoli, asparagus, tomatoes, potatoes. Just so you know I love verigated yarn, just enough of each color to make up what I need for each order. So far got 6 orders of fruits and vegetables loveit. Using up scraps. Also making up dolls with scrappy yarn hair for Christmas. Patchouli, COSunflower and Weedygarden like this. Do you use a pattern Jackie or just make up your own? I think I’d like to make some for the play kitchen that I have here for the grandkids. Patchouli and MoBookworm1957 like this. I take picture with my phone of the actual fruit, then look at a pattern from the 1960's and see what I can come up with. Got the pattern from thrift shop for a nickel. COSunflower, Dani, Patchouli and 1 other person like this.